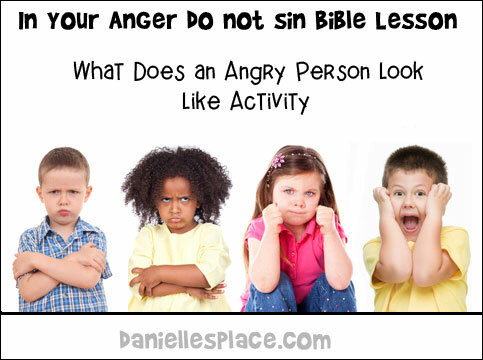 In this lesson children learn that anger is an emotion that everyone experiences. It is not a sin to be angry, but it is a sin to use your anger to hurt others, yourself, or to destroy things. They learn from Jesus' example how to handle anger in a constructive way. The teacher presents seven mad monsters and gives examples of things children can do to take control before the mad monsters do. 1. Before class print out the coloring sheets and make copies. 2. In class give your children the coloring sheets and crayons or colored pencils. As they work ask them why they think the the mad monsters are mad. Ask your students if they ever get mad and why they might get mad. If you don't have a lot of students, you can use the black and white Mad Monster Posters below. Have your children color them and them use them during the lesson. 2. Cut pointers from another piece of card stock and punch holes at the ends. 3. In class have your children color the Mad-O-Meters. 4. Punch a hole in the center of the Mad-O-Meters and attach the pointers with brass brads. 5. 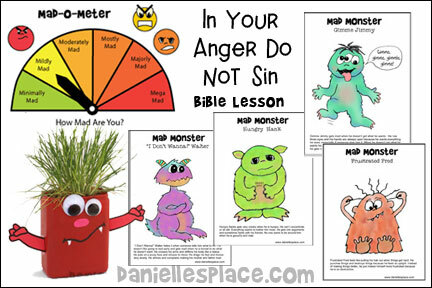 Instruct your children to take the Mad-O-Meters home and use them when they get angry to help them remember not to sin when they are angry. Tell them to try to find solutions to their problems before the meter reaches Mega Mad. 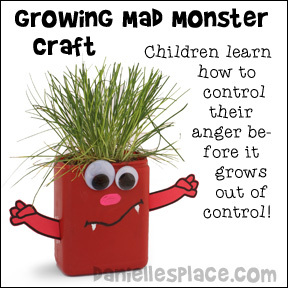 Children use this Growing Mad Monster to help them control their anger before it controls them. Plaster Container or Can - The container pictured is a red Hills Brother’s Cappuccino container. Fast Growing Seeds Such as Beans, Sprouting Seeds, Clover, Grass, etc. 1. Before class print out the arm patterns (Available to members) onto red paper or card stock and cut them out. If you are using a can or other container, you can tape red paper onto the can or spray paint them red before class. Or just leave them their original color. Use paper that matches the container color for the arms. 3. In class have your children draw a mad face on the container using the chalk markers or permanent markers, glue on wiggle eyes, and tape the arms to the sides of the container. 4. When they are done have them fill the container with dirt and add seeds or a plant. What Does an Angry Person Look Like? 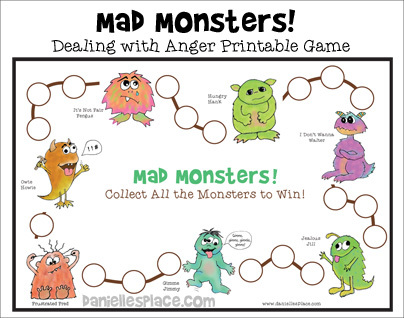 Use his printable board game to help your children talk about their anger and learn how to deal with it in a positive way. 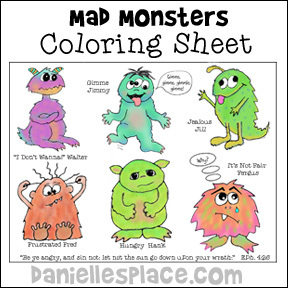 Children learn to control their 'mad monsters' with this simple game. When a child lands on a monster he gives an example of why he got angry when that type of 'mad monster' was controlling him. For example, if a child lands on the "Gimme Jimmy" Monster, he might say, "I got mad when my mom wouldn't buy me the toy I wanted. I yelled and whined until my mom threatened not to take me to the store any more." The child should then say how he could have handled his anger better. There are seven monsters: "It's Not Fair" Fergus, Hungry Hank, "I Don't Wanna" Walter, Owie Howie, Frustrated Fred, Gimme Jimmy, and Jealous Jill. The game board measures 14" x 10" and uses two sheets of card stock. It comes with directions, printable monster cards, and suggestions about how children can deal with their anger in positive ways. 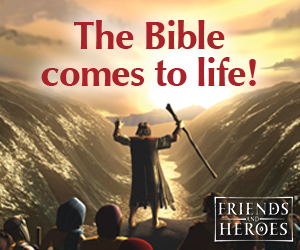 This game is available to members on The Resource Room or as an Instant Download. Children try to guess the letters that spell out the Bible verse before the sun goes down. Each time they guess a letter and it is wrong the sun strip is moved down one space. If the sun goes down before they guess the words to the verse, they lose. I taught this lesson "In Your Anger, Do Not Sin". A few weeks ago. It was right after the ruling on gay marriage and the SC shooting and doing away with the rebel flag. I had it planned way before all this happened and it was just a blessing from God to teach that day. The kids loved and it helped them to understand some things. 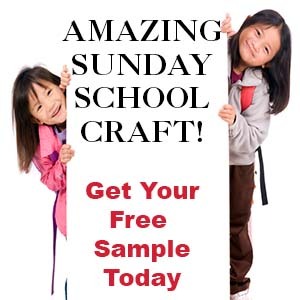 I teach both 4 & 5 year old children for Sunday School and 1st-2nd grade for Children's church. It went over so good. One of the other teachers borrowed it to teach his class of 3rd-6th grade. It gave them some understanding about how to deal with what was going on around them. They loved playing the game as well and we did the funny monster planter too! I used Herb seeds so that it would be something useful in the home. Most kids don't get to keep there crafts if they aren't useful. Thank you for all the wonderful lessons! I love them!